Well, I was almost right. I predicted the Rockets were going to get their first win of the season against the Spurs Saturday night, and they did just about everything they could to almost pull it off. Jordan Hill, Brad Miller and Yao react during a pretty intense game in San Antonio Saturday night. Click here for photos of Yao working out before the game. Yao didn’t play Saturday night against the Spurs, and instead will play in the back-to-back against Minnesota on Sunday night in Houston. They could have used him late in the 4th quarter Saturday night when both Aaron Brooks and Kevin Martin were out with injuries. But the bench did a good job making a nice comeback in the 4th to take the lead, but as we’ve grown accustomed to seeing this season, the Rockets found another way to lose. Courtney Lee missed two free throws that could have given them a 4-point lead with 16.8 seconds in the 4th quarter, which would have put the Spurs away. Instead, Manu Ginobili made him pay by hitting a cold-blooded jumper to tie the game with 9.9 remaining. Ish Smith missed a running jumper for the Rockets that could have won it with 2.8 seconds on the clock, then Manu almost made a desperation three-pointer that could have killed off the Rockets. Instead, both teams headed into overtime tied 113-113. Then with the Rockets holding a 119-118 lead in OT, Chuck Hayes was inexcusably stripped of the ball by Tony Parker who took it the other way for a layup and a 120-119 lead. You can pretty much predict what was going to happen the rest of the way…the Rockets didn’t have enough horses to overcome the absence of Brooks, Martin, Kyle Lowry (back spasms), and Yao. They even had three 3-point attempts in the final seconds to tie the game (Shane Battier, Lee, Luis Scola), but couldn’t hit any of them. Here is a photo of Brooks getting carried off the court at halftime. I saw on video Brooks injure his ankle, and it was terrible looking. He threw up a half court shot by jumping up in the air after running at full speed, and landed on the side of his foot. Awful. I’m not a doctor, but I’m guessing this will take a few weeks to heal. If Chase Budinger‘s ankle took a few weeks to heal before training camp, this has got to be just as long, if not longer. The Rockets are now 0-and-5 for the season. This is getting ugly, and fast. First though, I think Rocket fans all over are saying, no matter how tenuous the win might have been and the fact there are still many big games remaining, JOB WELL DONE! Yao Ming shoots a baseline jumper over Tim Duncan. But it would be Yao’s assists near the end of the game that would do the most damage. Click here for more photos from the game. The Rockets needed some help to get this win. There were so many big plays in this game, it would be hard to choose one over the other in prioritizing what was the most important in getting the victory. What’s amazing that in such a big victory, Yao only scored 13 points on 6-of-8 shots. Those assists to Scola at the end of the game were obviously huge, but it wouldn’t do the game justice just to focus on those plays. So what I’m going to do is bring up some of the most noteworthy plays in the game (both good and bad), ending with Yao’s incredible dimes to Scola to steal it from the Spurs. 10:04 – Yao lost the ball in the post. He simply mishandled it with no one poking the ball away. It wasn’t a good day for Yao taking care of the ball. A little over 2 minutes later, Yao throws a pass from the post to Aaron Brooks that gets deflected, stolen and results in a layup the other way. A little over 2 minutes later, he gets stripped for his 3rd turnover, which leads to a bucket the other way for a 21-11 Spurs lead. Then midway through the 2nd quarter, Yao falls down just dribbling the ball in the post. Roger Mason just “pulled the chair” from underneath Yao, which made Yao fall down. The problem is that Yao so outmatched Mason, he really didn’t need to put his full weight against him to get closer to the bucket. Besides, Yao doesn’t need to dribble that much. Just turn and shoot that turnaround jumper that he’s so automatic with. Wouldn’t you know it, he would do just that about 30 seconds later when he just shot it and scored! Keep doing that, Yao! 8:06 – Tim Duncan hits his 3rd field goal over Yao, and would finish the 1st quarter with 10 points. However, overall the Rockets would do a good job of holding him to ‘just’ 23 points on 8-of-22 shooting. :37.1 – Luis Scola hits a beautiful jump shot to give the Rockets a 25-21 lead. Scola would go on to hit several big jump shots, and layups (as I’ll describe in the 4th quarter), and finish with 19 points on 8-of-17 shooting, 17 rebounds, 4 assists, and 3 steals. What an amazing game! 10:30 – Scola hits another jumper. 30-26, San Antonio leads. 10:15 – Kirk Lowry blocks Drew Gooden at the rim on an open layup attempt, followed by Chuck Hayes running the break down the middle of the court, and dishes to Scola who is fouled! WOW! LOTS OF EFFORT ON THAT PLAY BY EVERYONE! Scola makes both FTs. He now has 10 points. 30-28, San Antonio leads. 9:50 – What a beautiful play this was: Kirk Lowry goes on the break and passes to Brent Barry in the corner, who goes up for a 3-pointer, then passes back to Lowry who catches the ball in mid-air, then bounce passes it high to Barry who is cutting toward the rim, then elevates and scores on a reverse layup! WOW! 30-30 tie, and an 8-0 run by Houston. THIS SECOND UNIT IS DOING AMAZING! ON THE VERY NEXT PLAY: BARRY STEALS IT, PASSES IT TO HAYES, WHO GOES BASELINE AND DOES A SPIN MOVE AT THE RIM FOR A LAYUP! WOW! 32-30 Houston. 10-0 run by Houston! 9:12 – Von Wafer steals the ball as it gets passed to Roger Mason. Mason fouls Wafer as they are both going for the loose ball! GREAT DEFENSE AND HUSTLE, VON! 8:15 – Von Wafer attacks the rim from the baseline, goes airborne, then dishes to Hayes who puts up a little floater that scores! 34-32 Houston. 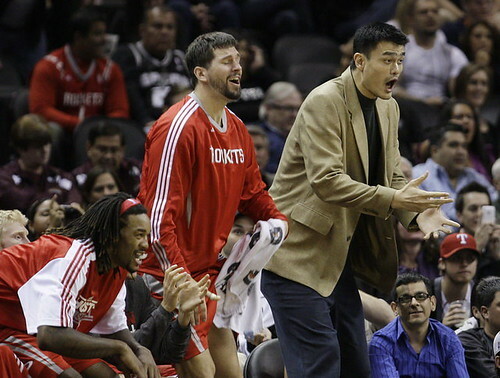 On the bench, Yao stands up and applauds Chuck’s effort! 7:40 – Kirk Lowry hits a jumper! The Rockets are now shooting 57% for the game, and lead 36-32. 6:48 – Brent Barry attacks the basket and is fouled! 2:33 – Scola hits another jumper. He’s so clutch! Houston leads 44-42. 2:11 – Tony Parker abuses Aaron Brooks in the post for the second possession in a row by driving hard to the hole and kissing it off the glass with the left hand. Give Parker credit, though. That was an amazing shot. 1:30 – Shane Battier hits a 3-pointer from a Scola pass. 47-45, Houston leads! :10.8 – From way outside, Ron Artest takes it strong to the hole and scores! What a play! 50-47, Houston leads. 7:27 – Ron Artest holds on to the ball too long, then jacks up an off-balance 3-pointer over Bruce Bowen, AND HITS IT! My goodness! The way he hit that leaning hits 3-pointer was almost Kobe-like. 5:25 – Aaron Brooks plays good D by blocking Tony Parker’s shot, and Kurt Thomas pushes Ron Artest out of bounds as they both go chasing after the loose ball. 4:44 – Scola hits another jumper from the free throw line area! Have you noticed how clutch he has been with that shot? Houston leads 62-56! 1:56 – Artest hits a long 2-pointer on the inbounds pass over Bruce Bowen. 64-56 Houston! :30.3 – Kirk Lowry steals the ball, dribbles it the length of the court on a fast break, then goes up strong for a shot, but the ball slips out of his hand for a turnover. End of 3rd quarter: The Spurs end the quarter on a 7-0 run. Houston leads 64-63. Houston scored only 13 points on 6-of-19 shooting in the quarter, but San Antonio wasn’t much better: 6-of-20 for 16 points. 11:42 – At the start of the fourth quarter, Yao does NOT dribble when he gets the ball and banks it off the glass! 66-63 Houston! 11:04 – Yao hits his second jumper in a row, this time over Kurt Thomas, AND AGAIN, NO DRIBBLING! 68-63 Houston! 10:15 – Lowry takes Parker strong to the hole and scores! Parker can’t handle Lowry’s size! 7:41 – Another missed offensive rebound by the Rockets after Parker misses a 3-point attempt, and Udoka burns the rockets with a 3! WHERE’S THE BLOCK OUT? 75-72 San Antonio. 6:36 – Udoka hits another jumper. Rockets trail 77-72. It’s not looking good, folks. JUST LIKE THE LAST GAME WITH THE SPURS, THE ROCKETS’ REBOUNDING IS A MAJOR PROBLEM, AS WELL AS MISSING SHOTS ON OFFENSE. 5:58 – Tony Parker hits a jumper. 79-72 San Antonio. This game looks like it’s just about over. 4:49 – Duncan misses a jumper, BUT KURT THOMAS GRABS THE REBOUND! 3:36 – Parker backs down Brooks and scores over him. That’s not a good matchup! WHY IS BROOKS IN THERE? 81-75 San Antonio. 3:04 – Battier hits a long, big 3-pointer! It’s 81-78 San Antonio. Houston has new life! 2:45 – Battier plays great defense out high on Roger Mason, who loses control of the ball. Mason tries to block out Battier from getting the loose ball – WHICH IS A FOUL THAT THE REFS DON’T CALL – but Battier is able to break through as Tim Duncan falls to the floor and tie it up for a jump ball! Good going, Shane! THEN BATTIER WINS THE TIP OVER DUNCAN! 2:29 With even more new life after Battier won the tip against Duncan, Brooks takes it strong to the hole, high off the glass, AND YAO TIPS IT IN! The San Antonio TV announcers say that Yao committed goaltending, but I don’t think so! Houston trails only 81-80. 1:45 – AARON HITS A JUMPER OVER TONY PARKER! WOW! IT’S 82-81 HOUSTON AFTER A 7-0 RUN! BROOKS WOULD ONLY HIT 2-OF-10 SHOTS FOR 5 POINTS FOR THE GAME, AND NONE WAS BIGGER THAN THIS ONE. 1:17 – Parker misses a shot and the ball goes out of bounds off San Antonio! Houston ball! :46 – Duncan misses a jump shot after Yao contests the shot, Kurt Thomas tries to tip it in, misses, but he gets the second tip, which goes in! Looking at the replay, Scola gave up too much ground to Thomas! C’mon Luis! Fight hard for the board! San Antonio leads 83-82! :29.3 – YAO THROWS A BEAUTIFUL PASS FROM THE KEY TO A CUTTING SCOLA DOWN THE MIDDLE OF THE LANE, AND SCOLA SCORES OFF THE GLASS! Although he didn’t block out very well on the play before, Luis made up for it right there! There have been 8 LEAD CHANGES AND 9 TIES in this game! :20.1 – Parker drives to the hole and scores easily around Brooks and Yao. Too easy!! Adelman gets mad at Yao for coming out too far from the basket!! :11.2 – Yao passes it from the key to Scola for a layup! 86-85 Hou. Both Scola and Yao are making mistakes on the defensive end, but they’re more than making it up on the offensive end! 86-85 Houston. Yao is playing the high post like Rick Adelman probably wanted him to do like Vlade Divac and Brad Miller when he became the coach of the Rockets! Where did those plays come from? We hadn’t seen that all season! And to do it crunch time is even more phenomenal! :0.3 – Parker misses a jump hook in the lane! OMG! On this play, Adelman decided to put Lowry on him, and it paid off! That was the best coaching decision of the game! Scola is fouled intentionally with .3 seconds remaining in the game. He goes to the line and misses the first free throw, and TRIES TO MISS THE SECOND SO THE CLOCK WILL EXPIRE, BUT HE MAKES IT! UNBELIEVABLY, BECAUSE OF A BAD SHOT CLOCK OPERATOR, BONNER HAD A SHOT OF WINNING THE GAME WITH A 3-POINTER, WHICH IS PHYSICALLY IMPOSSIBLE TO “CATCH AND SHOOT” IN .3 SECONDS, BUT LUCKILY BONNER MISSED IT, AND THE ROCKETS WIN! As disappointing of a loss it was for Houston to lose to the Spurs Saturday night at Toyota Center, I think there were lots of positive aspects to this game. Not to make excuses, but it was the second night of a back-to-back, and it’s tough for any team that has played 5 games in 7 nights to beat an elite team like the Spurs. Give them a ton of credit for the effort, coming back from 11 points down to make a game of it, having a couple of chances to tie it, before losing 88-85. 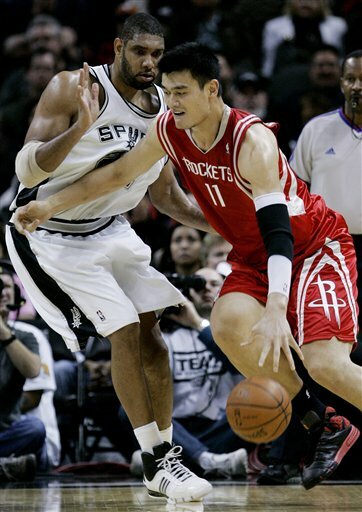 Yao had a nice game against Tim Duncan with 18 points on 9-of-17 shots, 11 boards, 2 blocks, and only two turnovers. His turnaround jumper was pretty much “on,” but he wasn’t going to be able to win the game himself. He was going to need help. Yao Ming throws one down on Tim Duncan after a spin move along the baseline. Click here for more photos from the game. Let’s talk about some of that help. First, Aaron Brooks was being exposed defensively by Tony Parker (28 points overall), which is expected because of the size difference. But when you’ve got a size disadvantage like that, you make up for it on the offensive end. Brooks achieved that, finishing with 18 points of his own. He scored 8 points in the third on 3-of-5 shooting to spark a 17-2 run that brought them back from a 55-44 deficit. All 3 of the shots AB made over Parker in the third were aggressive plays: one where he took it strong into the lane and scored on a wild (but under control) shot 2) one on a little jump hook over Parker, 3) and the last being a long two-pointer that would have been a triple if he hadn’t had his foot on the line. And I loved what the Rockets did several times late in the fourth quarter between Brooks and Yao: pick-and-roll, with Brooks taking it strong to the hole and either scoring, or if he missed, the Rockets getting the offensive board. That happened on 3 straight possessions in which he scored at the 1:50 mark. Then at the 1:12 mark, he attacked the basket, missed the shot, but Scola grabbed the rebound and was fouled. And then he attacked the basket with :43.6 remaining, missed, but Yao grabbed the rebound and slameed it home to bring the Rockets within 86-85. They tried to do it one last time where AB took it strong to the hole, amazingly got past Tim Duncan, and put up a shot from underneath the backboard, but it hit the underside of it, the Spurs rebounded, and the Rockets were forced to foul Parker intentionally. I think something is being completely missed by people complaining that Yao needs to get the ball more. When you’ve got guards who can take it to the hole and score like Brooks, Von Wafer and Kyle Lowry, you’d like for them to do that because it’s not only a higher percentage shot, but they will either score, get fouled, have an opportunity to dish for an assist, or IF THE SHOT IS MISSED, THE BIG GUYS CAN BE THERE TO GRAB THE OFFENSIVE REBOUND AND SCORE IF THEY’RE AGGRESSIVE THEMSELVES. I believe big men actually prefer to grab an offensive rebound when a teammate puts one up on the rim for them, rather than have to slug it out in the low post dribbling the ball and having a chance of getting it stolen or blocked. That’s why I think it’s incumbent for the bigs to crash the boards more, including Yao, but for some reason that doesn’t seem to be happening enough when the guards attack the rim and miss. Part of the problem with one option in that equation, dishing for an assist to Yao, is tough because Yao’s hands are not that great catching passes in traffic. That limits them greatly, but they can still do it with Luis Scola or Carl Landry, like they’ve done on plenty of occasions this season, but not in crunch time. They’re still trying to find who’s going to be the guy involved in the pick-and-roll in clutch time. Give it some time. I think Scola and Landry can be those guys, as mentioned above. Also, remember it took some time for Tony Parker to become who he is. Remember when the Spurs were thinking of getting rid of him early in his career and getting Jason Kidd? Brooks reminds me of that. He’s fast, can score, and he’s smart. He needs to work on throwing better passes into Yao in the post, though. He’s throwing bounce passes into Yao that are very easy for defenders to read and steal. Part of the problem may be because since Brooks is so short, he can’t throw an entry pass over his defender, so going ‘underneath’ with the bounce pass is really his primary way of getting Yao the ball. 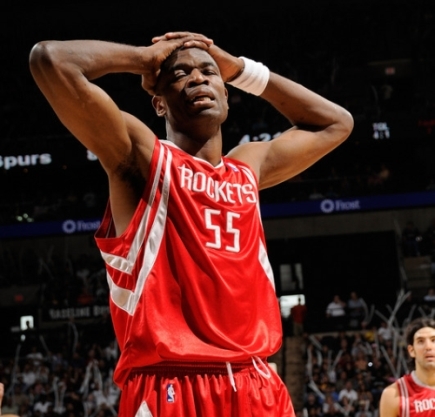 Dikembe Mutombo reacts after a referee’s call Sunday afternoon in San Antonio as the Spurs blew out the Rockets, 109-88. San Antonio shot 53% from the field, 64% in the first half while Houston only shot 40% with Tracy McGrady shooting only 23% for 13 points. If you’re a fan of basketball in the state of Texas, you had to be dumbfounded that some of the geniuses at the NCAA decided Friday night to schedule the huge ballgame game between the Texas Longhorns and Memphis for Sunday afternoon so that it would conflict with the Rockets-Spurs game, another huge basketball game in the state of Texas. What were they thinking? There was plenty of opportunity for the NCAA to schedule the UT-Memphis game in the mid-afternoon so there would be no conflict. But nooooooo, they had to screw the basketball fans having tickets to either game from watching the other game on TV, or fans at home who wanted to watch both games without having to flip channels every 10 seconds. Luckily for the NCAA, hoops fans in Texas who wanted to watch both games really didn’t have to face a choice since the Rockets game was essentially over as the Spurs took an early lead, built it up to 25 points, and coasted to a 109-88 win. The Spurs started off shooting hot, making 76% of their shots in the first quarter to take a 35-24 lead. The Rockets were trying to keep the Spurs from getting into the lane and creating all kinds of problems, so they forced them to shoot outside, and the Spurs made them pay. Yao Ming celebrates with teammate Luis Scola after Yao grabbed a huge rebound and threw it down against Tim Duncan late in the Rockets’ game against the Spurs. Yao scored 21 points and grabbed 14 boards in an intense victory to help Houston snap a two-game losing streak. I’m back at it. Thanks again for all your nice comments while I’ve been out. After having shoulder surgery on Tuesday, I’ve spent the past few days recuperating, fighting off dizzy spells resulting from my post-surgery drugs, and trying to get over that debacle of a game last Tuesday night against the 76ers when the Rockets blew a 16-point lead late in the third quarter. I’m still hurting after that one. Good thing I wasn’t able to write much after that game or I would still be writing based on all that I felt like venting after watching it later on my DVR. Despite Tuesday night’s collapse, I would bet the Rockets surprised a lot of people Saturday night in beating the Spurs 83-81 at Toyota Center. Just a reminder that I can’t type as fast as I normally would, so please excuse how brief this post may be, any typos, and some things that may not make complete sense because my brain is still fuzzy from the drugs. This game came down to the final seconds where the Rockets held on despite almost giving the game away by missing several free throws late in the game (Yao missed 3 in a row, and Rafer Alston missed a big one late). But San Antonio’s Matt Bonner missed a potential game-tying shot that could have sent the game to overtime and could have been a third nightmarish collapse in a row for the Rockets, who held a 12-point lead in the third quarter. Tracy McGrady was able to play, but Rick Adelman didn’t start him. Instead, he started Bonzi Wells and had Shane Battier on the bench. Come to find out after the game that Battier volunteered to come off the bench since Manu Ginobili also does the same, and Battier usually guards Ginobili. The more Adelman thought about it, the more he liked the idea, and the more I like the idea for every game. Yao Ming drives to the hole against San Antonio’s Tim Duncan on Friday night in a game the Rockets lost 90-84 in San Antonio. Yao had a sub-par game, scoring only 14 points on 7-of-16 shooting and turning the ball over 7 times, but he did grab 9 rebounds and block 3 shots. But boards and blocks don’t really matter because the Rockets have now lost 3 in a row. Click here for more photos from the game. I knew that even with Tracy McGrady out of the lineup for Friday night’s game against San Antonio, the Rockets had a very good chance to win, even after one night after the Spurs got beat by the Mavericks on national TV. On paper, the Rockets still have enough talent to beat anyone. But in order to have a shot of beating the Spurs, the Rockets were going to have to play a near perfect game. They didn’t, losing 90-84, and it’s starting to bug me how they are losing. Yao gets in a great workout before the Rockets-Spurs game Saturday night at Toyota Center. He also likes his new leg brace, too. Click here for more photos from Yao’s workout. Later, the Spurs decimated the Rockets in a disturbing, lopsided 97-74 win. The only good thing that happened Saturday for the Rockets was that Yao got in a great practice, as you can tell by the sweat in his t-shirt shown in the photo above and the link to more photos from his workout session. Yao also appears to like his new leg brace more than any of the other four he has tried out so far. Later on Saturday night, San Antonio spanked the Rockets in a game that was played in front of the second-largest crowd in Toyota Center history. What a way to make an impression. The Spurs jumped out to an 18-5 lead in the first quarter, and led 40-20 by 8:23 remaining in the second. T-Mac cut the deficit to 12 right before halftime with a three-pointer, but once the second half got underway, it was clear the Spurs were the better team, especially when they built their biggest lead to 29 points. Houston only shot 38.5% from the field and turned the ball over 18 times compared to San Antonio’s 52.2% shooting and 13 turnovers. That was the difference, as well as Tim Duncan’s dominance early. The Rockets looked so good on Friday night in Denver against the Nuggets where they shot 46.7% from behind the arc, but they only shot 30.4% Saturday night. I’m actually surprised that Van Gundy has allowed his team to rely on shooting so many three-pointers because as they say, “live by the three, die by the three.” On Saturday night, they definitely died. I’m also surprised a veteran team like Houston’s does not do well in the second game of back-to-backs back at home, where they have now lost 4-of-5 of those at Toyota Center. And you can’t say the Spurs were more fresh because they had just played the night before as well, albeit their game was at home in San Antonio. Even worse, there was dissension on the Rockets’ bench after Van Gundy benched Rafer Alston . The Chronicle does a good job describing it in this article. I can’t remember when I’ve seen a Rockets’ team crack like that, but I’m the kind of guy where I like to see that kind of fire when players are underachieving. It can shake things up and teams can come out of those episodes stronger and more united. Clearly, though, it’s going to be Yao’s insertion back into the lineup that will give Houston hope that they can keep this season from spiraling out of control. Tracy McGrady blows by the Spurs’ Bruce Bowen Wednesday night in a game where T-Mac willed the Rockets to a 90-85 victory with 37 points. Before the Rockets’ game on Wednesday against the Spurs, Tracy McGrady vowed they would come out ready to play after one of their most disappointing losses of the season against Denver the game before. So I was watching very carefully to see what kind of start the Rockets would have in San Antonio. It turns out T-Mac was wrong, at least at the start. The Rockets turned the ball over 4 times to start the game, couldn’t hit anything, and quickly were down 12-2. But the Rockets recovered, kept the game close, even took a big 13–point lead in the fourth quarter, blew that, but held on for a 90-85 win. McGrady ended up being The Man at the end, redeeming himself with his vow that he would be ready. He scored 37 points on 14-of-24 shooting and made 8-of-9 free throws. He also had three assists, all which came on three consecutive possessions when he drew the double-team, then kicked it to Juwan Howard for buckets. Those plays were artistry in motion. He scored 14 points in the fourth quarter to hold off a Spurs’ charge that almost ended up with another late-game Houston collapse. His biggest miscue, and recovery, occurred with about a minute remaining in the game. 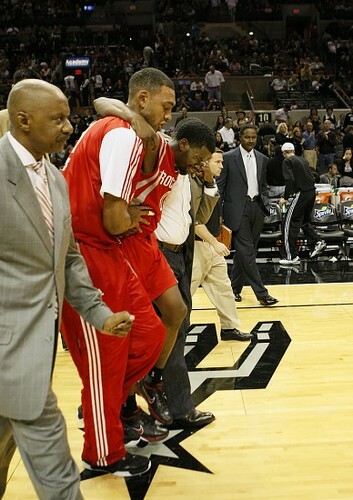 The Rockets led 85-81, and T-Mac was stripped bringing the ball up the court. He almost recovered it, but he slipped, and that led to a layup by Tim Duncan (37 points) to cut the lead to 85-83. On the ensuing possession, McGrady made up for it by hitting a huge 20-foot jumper, was fouled on the shot, and hit the free throw to give the Rockets a 5-point cushion with 55 seconds remaining. The Spurs’ Manu Ginobili responded just a few seconds later to cut the lead 88-85. After that, the Rockets needed a big hoop to fend off the Spurs, but Rafer Alston came up empty on a running jumper. That gave the Spurs a chance to tie the game. However, Brent Barry passed up a three-pointer and dumped it down low to Tim Duncan, who had good D played against him as he missed a short bank shot off the glass. Alston came up with the rebound, got fouled, and surprisingly hit both free throws to sew up the victory, 90-85. I have to give Alston credit for hitting those free throws. He’s not known as the best clutch FT-er in the game. He also had a decent stat line: 19 points on 7-of-15 shots, 3-of-6 three-pointers, 7 assists and only two turnovers. All the Houston Chronicle guys are giving him credit for a good game. And yes, he deserves some praise. But the maddening thing for me is the fact he could be so much better. He’s a quick guard who can get to the rim anytime he wants. Except on a few rare occasions, he just can’t finish. Except for a big bucket where he floated a teardrop over Duncan in the fourth quarter, he blew several easy layups in this game, too. ESPN mentioned how Alston realizes he’s now known as not being a great finisher. So you would think he would avoid his weakness by not taking it to the rim so much and sending his second-lowest FG% in the league (for a starter) to even greater depths. One other mental lapse had: late in the game there was a jump ball between T-Mac and Tony Parker. You know T-Mac was going to win that jump, and you knew exactly where he was going to tip it: right where Alston and another Rocket (can’t remember who) lined up next to each other. That’s just how you play jump balls. But Alston fell asleep and let Brent Barry get behind him as the ref threw the ball up in the air. T-Mac tipped it right where it should have been tipped, behind Alston, and there was Barry to catch it. Okay, enough of my Alston bashing. Since he had a good stat line, I’ll lay off for now. To finish up on a positive note, you have to give credit to the Rockets for pulling out a huge victory without Yao on the road against a 30-13 team, and to do it after one of their worst losses of the season against Denver at home without Carmelo Anthony in the line-up. The Rockets have won two in a row in San Antonio, something that hasn’t happened in 10 years. Now the Rockets come home for 5-straight games against what TV analyst Bill Walton called “cupcakes” (I love it): Portland, Philly, Seattle, New Orleans/OKC, and Minnesota. All teams with losing records. If the Rockets don’t win all 5 of these games, then it will be very easy to forget about this big W against the Spurs. Yao shoots one of his unstoppable fallaway jumpers against Tim Duncan Friday night in a suprising victory over San Antonio 97-78, snapping a 17-game losing streak in the Alamo City. Yao got into foul trouble and scored ‘only’ 22 points, but the rest of the team stepped up and played one of their most impressive games of the season. Click here for more photos. All the odds were against the Rockets heading into Friday’s game against the Spurs in San Antonio. After all, the Rockets had lost 4 of 5 games, they had been on the road 10 straight days, T-Mac was still out because of injury, and Houston’s bench hadn’t been doing anything lately. But the Rockets put all that behind them and shocked me and the rest of the world by playing one of their best games of the season, winning convincingly 97-78. Give them credit for bouncing back after a tough loss against Portland Wednesday night. Yao got into foul trouble that limited him from dominating the boxscore (“just” 22 points and 7 rebounds). But everyone else pulled their weight, and then some. Yao did start the game off strong, scoring 10 of the Rockets first 12 points (14 points in the first quarter) thanks to a couple of nice assists from Rafer Alston passing over the top to Yao while he was being fronted defensively. Luther Head also had a nice dish by penetrating to the basket along the baseline, then whipping a pass to Yao for a layup. Not a bad way to start. Chuck Hayes also ‘exploded’ offensively in the first, scoring 6 points on 2-of-2 shooting, with one of those buckets coming from a nice hustle tip-in after crashing the boards. He also hit 2-of-2 free throws, even with that strange hitch in his shooting form. You knew the Rockets were destined for a good night after seeing him sink both of those! Bonzi Wells also hit 2-of-2 shots in the first, thanks to a sweet pass from Juwan Howard for a layup. Overall, the Rockets did a fantastic job moving the ball around to get great looks, hitting 12-of-22 shots for a 30-21 lead after the first quarter. In the second quarter, Yao cooled off and only hit 1-of-5 shots, but the Rockets got a great contribution from one of my favorite underdogs, John Lucas III. I was pleasantly surprised Van Gundy put him into the game so early since he had played only 6 minutes in the past four games. In the course of one minute of action, Lucas scored by finishing nicely on two fast breaks. I always get skeptical when the Rockets are running on a fast break, because other than T-Mac, they really don’t have someone you can count on who can jet down the floor and finish reliably with a defender or two in the way. But Lucas has an uncanny ability to get a good angle on the rim during fast breaka, elevate over other guys and lay balls in (as he showed on thes fast breaks), which is incredible since I have stood next to him and he’s no taller than 5’10” (listed as 5′ 11″). Lucas is fearless going to the hole, and is quick and can create his own shot like when he hit a sweet stop-and-pop jumper a couple of minutes later. His quickness reminds me a little of Tony Parker, and Van Gundy may have wanted to fight Parker’s quickness with Lucas’. It can’t hurt to fight fire with fire. Lucas finished the game with 9 points in 13 minutes on 4-of-6 shooting, including a big three-pointer in the fourth quarter. All I have to say is this: keep playing John Lucas! He showed what he could do in Vegas, and his situation reminds me a little bit of Mike James when James, a virtual no-name when he came to the Rockets, made a name for himself offensively after coming to Houston. Bonzi also showed he can play and is quickly getting into shape by hitting 3-of-5 shots in the second quarter, including a drive to the basket that caught the Spurs surprised. Later in the quarter he also scored on a fast break. Bonzi brings an element to the game the Rockets have sorely lacked since T-Mac’s back fired up again – the ability to create his own shot. I have also been impressed with Bonzi’s willingness to make a pass when he is faced with a low-percentage shot. He passed the ball a couple of times to other players when his shot wasn’t as high percentage as an open teammate’s. Thank God Van Gundy wasn’t too stubborn several weeks ago when he was having his differences with Bonzi and kept the door open for him to return, especially after T-Mac got hurt. That move (or non-move) could have been the best break of the year for the Rockets. By halftime, the Rockets had shockingly hit 55% of their shots and led 53-36. Yao had 18 points and 4 boards, and the Rockets offense held a 21-12 rebound advantage, holding the Spurs to zero offensive boards. Since the Spurs’ Francisco Elson and Fabricio Oberto were having a hard time containing Yao, Tim Duncan had to help out in defending Yao. The effort required to defend Yao must have limited Duncan’s offensive effectiveness since he only scored 14 points on 4-of-13 shooting. But you also have to give credit to Juwan Howard (along with Yao and Chuck Hayes) for playing great D against him. Juwan also was extremely valuable offensively, hitting several long jumpers as the Spurs’ defense packed it in low and left him open, allowing him to score 14 points on 5-of-8 shooting. He also chipped in 4-of-5 free throws. Give the guy credit for still be very productive in his 13th year. He was needed this night since Yao picked up his 4th foul about midway through the 3rd quarter. In the fourth quarter, the Spurs threatened a couple of times after Yao had to sit after picking up his fifth foul with 7:53 remaining in the game. Manu Ginobili kept the Spurs within striking distance by hitting two three-pointers in the fourth quarter (4-of-6 overall), but Luther squashed a rally when he created his own shot and hit a jumper to make it 81-65 with 7:23 remaining. A couple of minutes later, Alston hit a three-pointer to make it 86-68, then put the game out of reach with about 4 minutes remaining when he hit a Parker-like floater in the lane. 2) they moved the ball extremely well. Luther Head had a career-high 11 assists. 3) everyone stepped up and hit shots (51% shooting overall), including the much maligned bench (15-of-26). 4) their defense held San Antonio to their lowest scoring second quarter (15 points) first half (36) and final score for the season (78). The Rockets’ defense will always keep them in games. 5) they have a few new weapons the Spurs aren’t accustomed to seeing. In addition to having to defend Yao, they have to account for Bonzi, Lucas, a much improved Alston (compared to last year), and a great shooting Juwan. I loved seeing the reaction by Yao and his teammates at the end of the game, with lots of high-fives and attempted chest bumps between Yao and Juwan that failed to connect cleanly, creating lots of laughs. But on a night where everything else was clicking, those missed attempts were easy to overlook. You are currently browsing the archives for the vs. San Antonio category.